When choosing a product or service, you’re looking for value. You want high quality at a fair cost, and you’ll search for the best value. 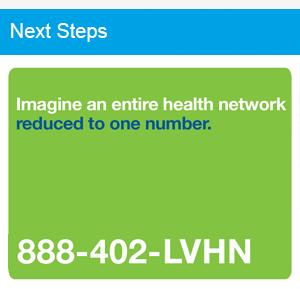 At Lehigh Valley Health Network (LVHN), we’re driven to give you health care value. We aim to help you achieve better health by delivering better care at a better cost. Lehigh Valley Hospital (LVH)–Hazleton’s robotic surgery team is a great example of how we give you health care value. The team partnered with the robotic surgery team at LVH–Cedar Crest to get the program up and running, and in January they were ready to perform the very first hysterectomy with robotic surgery in Hazleton. However, this was not a typical case. Their patient wanted to avoid a blood transfusion due to religious beliefs. She declined a transfusion, even if it was medically necessary. The stakes at the time of surgery were high, but the team was ready. Thanks to the numerous benefits of robotic surgery, the team is able to perform “bloodless” surgery. With robotic surgery, transfusions are needed less than 1 percent of the time, compared to 25 percent of the time with an open procedure. When a hysterectomy is performed as an open procedure, it typically results in a three-day hospital stay. Their patient was discharged early in the afternoon on the same day she had her surgery. She experienced so little pain afterward that she only needed an over-the-counter pain reliever. Better health – Patients experience less pain, spend less time in the hospital and recover faster. Better care – Robotic surgery lowers the risk for infection and complications. Better cost – Robotic surgery reduces length of stay and readmissions, preventing patients from occupying precious and costly hospital resources. Data from 601 LVHN patients who had robotic surgery for benign conditions over a five-year period translates into saving more than 600 days in length of stay. And because these patients were out of the hospital sooner, more beds were available for people who needed hospital care. Our robotic surgery teams, and all of LVHN’s health care professionals, are humbled and proud to give you and your loved ones the health care value you expect and deserve.